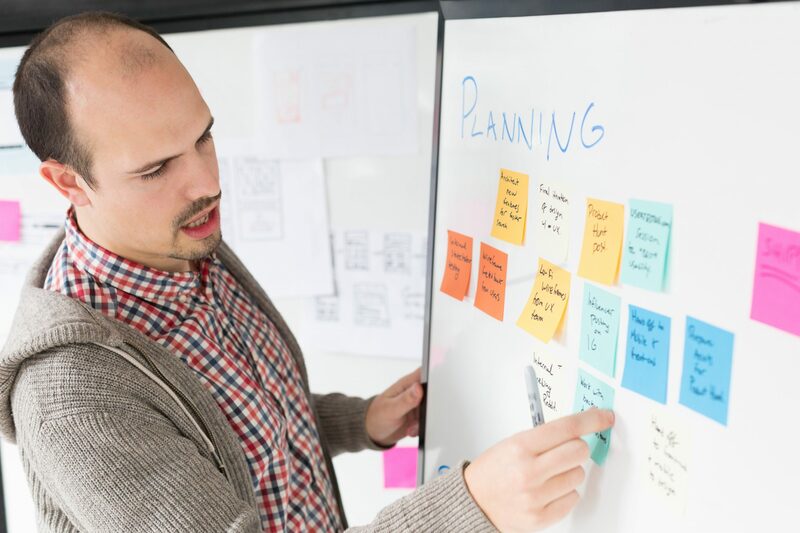 If your charity or social enterprise is feeling pulled in too many directions, analysing projects in terms of mission and money can help you to focus resources where they will make the biggest difference. Focusing resources for maximum impact. Your activities are closely aligned to your purpose. You are best placed to deliver them. They will make the biggest difference. In this post I’ll focus on the first point – how to determine if your activities are in alignment with your mission or purpose. 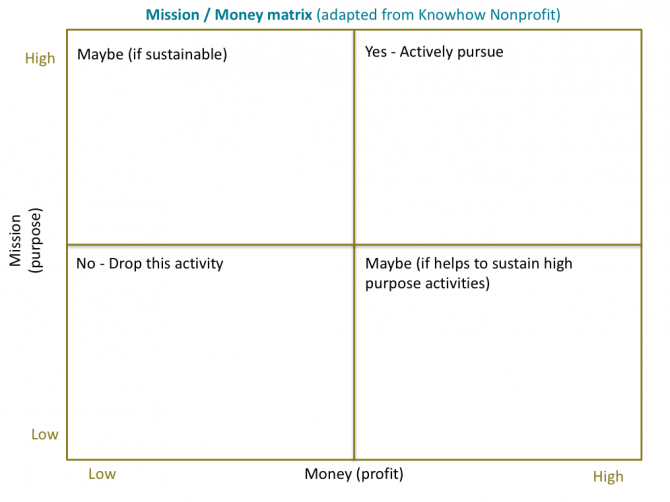 To do this you can use the following matrix, which is adapted from NCVO Knowhow Nonprofit’s Mission/Money Matrix (and based on the Boston Consulting Group’s Matrix). If you are struggling with a diverse portfolio of projects and feeling conflicted I would suggest using this matrix to help prioritise and consolidate your charitable activities and earned income. Map each project or activity on the matrix, depending on its contribution to your purpose (mission) and money (profit or sustainability). What do each of the boxes mean for me? The top right-hand box is where you want to focus most of your energy and resources. It’s here that you’ll find the activities that are high purpose and high profit. It’s these items that you want to actively seek out. On the bottom left you’ll place activities that are low purpose and low profit. These items are a ‘no’. You should stop any work that falls into this category as soon as you can, as it’s a drain on your time and money. The tricky decisions come with the other two boxes or items that are a ‘maybe’. The activities that fall under low purpose but high profit are mainly income generating activities. These activities are a good use of your time if they are genuinely contributing towards your core costs and reserves. They can help to fund other activities that are high on purpose but low on profit. Again, it’s a harder decision to make with activities that are low profit and high purpose. This is probably where most of your charitable activities fall. However, a balance needs to be struck and I think this is where many third sector organisations come unstuck. This kind of work pulls at the heartstrings. But, unless you have lots of activities in the ‘yes’ box and the other ‘maybe’ box (high profit, low purpose) that are generating a surplus, or you have healthy reserves, I think you should re-consider this kind of work. If you’re overstretched and under-resourced, it’s likely that the balance is off, and there are too few activities in the ‘profit’ boxes. I think that for many organisations this imbalance can be a fast track to insolvency. Determining which activities to prioritise can be difficult, but is essential for a sustainable organisational strategy. If you need help doing so for your charity or social enterprise please book a call today. 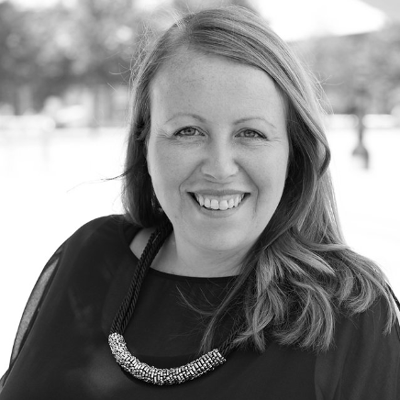 FOUNDER & LEAD CONSULTANT Emma has first-hand experience of the thrills and terrors of charity leadership. Dedicated to the non-profit sector for 21 years, Emma has both depth and breadth of experience as a CEO, Consultant, Trustee and Chair, Fundraiser and Grants Assessor.